Last October I reviewed the Balvenie Peat Week 2002 14 Year Old which I quite liked but I neglected to review its sibling Peated Triple Cask 14 Year Old which is an exclusive offering for Travel Retail market so it’s time to fix that. This entry was posted in Whisky Reviews and tagged Balvenie on April 10, 2018 by Yoav @ Whisky Gospel. Until recently, the only peated Balvenie we had were the long gone limited edition Balvenie Peated Cask 17 Year Old (which I reviewed a few years ago) and the Islay Cask 17 Year Old. But states has changed recently with two new peated Balvenies, both 14 year old expressions, were released to markets. 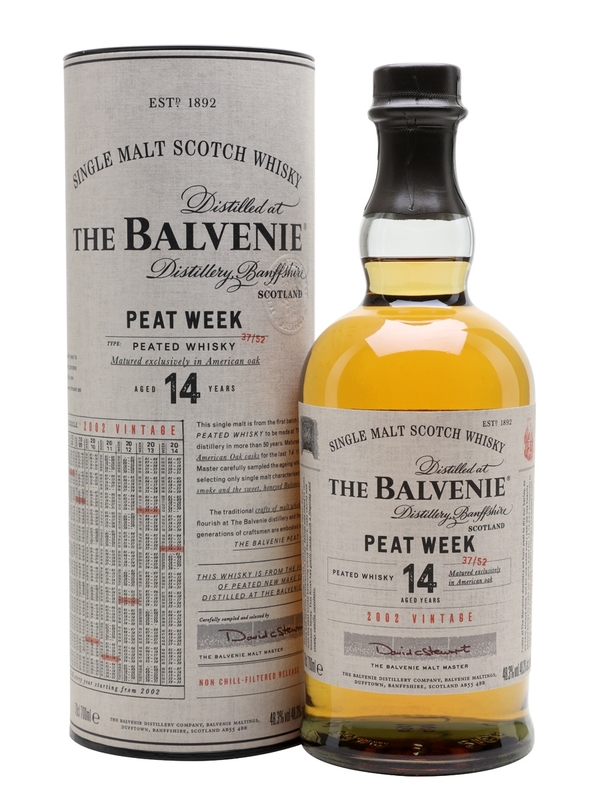 The first is a Triple Cask 14 Year Old for Travel Retail market and a globally released 14 year old named Peat Week as Balvenie produces peated whisky for one week a year (and not every year), naturally called named ‘Peat Week’. Today I’m checking out the Peat Week 14 Year old that was distilled in 2002 and has been aged in American Bourbon oak for 14 years. This entry was posted in Whisky Reviews and tagged Balvenie on October 24, 2017 by Yoav @ Whisky Gospel. Lately I tasted a few Travel Retail exclusive expression that left me unimpressed with their quality. Luckily there were a few that bucked that trend, but when you factor along the news on more NAS whiskies coming up, dropping standard age-statement whiskies from the TR market, you can not but worry about the overall change we’re witnessing at the Travel Retail channel. Although big conglomerates as Diageo and Pernod Ricard drop the age statement from new Travel Retail releases with Mortlach Special Strength, Glenfiddich Casks series and many other examples, the smaller players in the Travel Retail market kept age statement for their Travel Retail releases, like Balvenie did with their Triple Cask range, Bacardi with their “The Last Great Malts” and others. But we know that age statement doesn’t guarantee quality. Especially not when you’re in the Travel retail market with large captive audience looking for some whisky purchases before going on a plane. Could it be that Travel Retail market is playing itself into a separate game-field with new rules thus making it a less relevant market for whisky aficionados? The Balvenie Triple Cask 25 Year Old (along with the other expressions in the series: 12 yo and 16 yo), have been matured in three kinds of casks: refill casks, first-fill ex-Bourbon barrels and Oloroso sherry butts (Hence the Triple Cask name for the range) and then were vatted together and were left to marry in a tun for around six months. As the high end offering from Balvenie in the Travel Retail it should teach us a lot on how we should treat that market. This entry was posted in Whisky Reviews and tagged Balvenie on January 18, 2016 by Yoav @ Whisky Gospel. Yesterday I reported on the Balvenie tasting held in TLV earlier this week and I suddenly noticed that I didn’t publish tasting notes for the 17 Year Old Peated Cask on the blog although I did taste it numerous times in the past, so let’s fix this, OK? The 17yo peated cask is a standard Balvenie unpeated spirit that was finished in casks that held peated spirit. Yes, Balvenie do distill peated spirit, but they do so for only one week every year. The Peated cask is a discontinued expression so prices are high considering its age, but it may be worth it. let’s check. This entry was posted in Whisky Reviews and tagged Balvenie on November 27, 2014 by Yoav @ Whisky Gospel. Yesterday our off-the-beaten-whisky-track country got to host a real Balvenie tasting where the Balvenie range (at least the part is imported to Israel) was showcased. This tasting, organized by our local Balvenie importer HaCarem, was led by Jonny Cornthwaite, a Balvenie ambassador who did a great work leading the audience through the tasting. We started with a sip of Balvenie new make bottled at 69.7%. It was oily and malty with coconut, fruity touch with herbal/floral edge and overall very clean and fresh, clearly showing the Balvenie profile we know from their whiskies. We then moved to the real lineup which included Balvenie 12yo double wood (of course), the 17yo double wood, 21yo portwood and the 17yo peated cask which isn’t produced anymore but seems like we still get some from the dwindling stocks left in the warehouses. In between tastings, Jonny explained the process of producing whisky and how Balvenie keeps up the old whisky production tradition. The tradition keeping was a very prominent part in the presentation and is an integral part of how Balvenie define themselves. But the for me, the highlight of the tasting was sitting down with Jonny along with my fellow Israeli whisky bloggers (Gal & Michael), discussing and dissecting whisky and whisky industry and getting to taste the Balvenie forty year old which immediately made it the best whisky day in a long time! This entry was posted in Whisky Reviews and tagged Balvenie on November 26, 2014 by Yoav @ Whisky Gospel. I’ve tasted many of the Balvenie core range whiskies: from the 12yo Double Wood to the 21yo PortWood and some indies (spooned Balvenies). I even had a fabulous tour at the distillery (read my recap here). But how about aiming high and try the one high-end OB Balvenie we mortals can have (without going bankrupt)? No, it’s not the Tun 1041 as I don’t think we can consider the Tun 1041 as core range OB, I’m talking on the Balvenie 30 years old. It’s a cask strength Balvenie, although the ABV may be misleading at 47.3%. The 30 yo Balvenie was matured in a combination of American oak and Oloroso sherry casks. This entry was posted in Whisky Reviews and tagged Balvenie on May 13, 2014 by Yoav @ Whisky Gospel.